You’ll also have a chance to win concert tickets, try out cool new apps and games along with winning movie tickets. Hip hip hooray! Carly personally delivers movie tickets to your door…just kidding Andrew! Look to your email for more offers that fit your 4G Lifestyle. give my password to eprize? No thanks. not your tmobile password, whatever password you want for the VIP thing. Use your My T-Mobile password, if you have one. But i’m in the VIP system tho. I wonder how long the verification process takes. I think we need some external verification this is on the up-and-up before people start providing a bunch of PII to this site…. PII I have not heard anyone use that term since I worked at alltel. Seems like a Phishing site? what’s your phone #? we recommend you use your Tmobile password? sounds like something that they can use to just log into your account. Then don’t use your t-mo password…. legit or ? what kinda password they want? banking , email or something else? They will give you something on your birthday…duh. It needs your DOB because you must be 18 or over to enter the sweepstakes. ok they got most of my inFo except SS and it automatically says I have alREdy signed up and after that it was stuck on PENDING? Maybe you haven’t been with t-mo long enough to be vip? I don’t know. I WONDER IF BEING WITH THEM FOR 9 YRS IS LONG TIME! You end up in the same place. Both domains are registered by DEUTSCHE TELEKOM AG. I hope you are kidding, have you actually ever been to http://www.TMOBILE.com???? It redirects you to http://www.t-mobile.com. Are you saying that is a scam too? I have had a rep confirm that this site is legit, and has been up since the 24th of this month. tmo reps dont know anything other than what they have infront of them, they dont know about phone updates, new plans or anything, all they know is current thing on website. this site looks a total scam! I believe the site is a scam too. Only one link at the bottom redirects to the official TMO site. Also, hover your mouse over the other links and check out where they redirect. Smells fishy to me. 8. Publicity: Except where prohibited, participation in the Sweepstakes constitutes each winner’s consent, permission and grant to Sponsor’s and its agents’ use of winner’s name, likeness, photograph, voice, opinions and/or hometown and state for promotional purposes in any media, worldwide, without further payment or consideration. I won a bluetooth headset. I was really hoping to win a phone. Is it possible to win more than one prize? I just won a year of free service and they want alot of personal info *scratch head* has anyone won any thing yet and got it? the personal info, your social and dob, are typical requirements to claim a sweepstakes prize. They are needed for your tax returns as you will need to claim the winnings on a 1099 when you file. A free year of service with 10gb of data a month! Hell yeah! You won twice?! How long after sending in the affidavit did you receive the gift card? The first one took about 6 weeks. If you read the rules, you can win one of EACH item. I played that match game on a daily basis though. I also just won the free year of service. I don’t want to setup a new line so I’m going to try to sub it for a credit, gift card or any form that equals two new phones for free. The rules say it’s rewarded as a digital code, so I’m sure you can apply it to the line you already have. All the other prizes are awarded as gift cards. Here is an update – I will receive a credit every month for a year. 1439.88/12 = 119.99 every month. Very happy since this will cover my full monthly bill with a little left over. Congratulations! That’s awesome! I received an email that they received my affidavit of illegibility and I’ve been approved. I’ll be receiving my gift card for the G-Slate in accordance of the rules which stated about 6-8 weeks after the end of the promotion. And a heads up for this sick joke. I, too, won the one free year of supposed unlimited talk, text and web with 10gb of data a month. What I actually was three T-mobile gift cards. Not the kind either that are prepaid credit cards. These are just T-mobile. Now here’s the fun part. Not only did I not get some magic code to give me an upgraded days plan and a monthly credit on my account, but the gift cards can’t even be used online. You can’t part your bill online with them. You can’t buy anything online with them. The ONLY place you can use them is at one of the brick and mortars. This is beyond sketchy. Am I wrong to be more than a little mIffed by this? You can go into the store and apply them to your bill though. I ended up going before I received the cards to take advantage of the sale on the 19th and get a Samsung Galaxy 10.1 instead of the won G-Slate and also an amaze 4G. We applied the cards to the remaining payments of the Tab, the phone, and then the remainder went towards my monthly bill. The rebates I will get will cover a LOT of the initial down payments of the devices. I really wish I had the cards sooner, but the sale made too much of a difference to wait. I think you still can. They see the data part as a service and not necessarily part of the “plan.” If you go look at your account at mytmobile.com, you’ll see what I mean. If it is a plan, you can’t change it mid-contract, however you can your services. (At least I’ve been able to in the past.) You could up your data then apply the cards and get your 10GB free without paying for a mid contract change. Looks like 5gb is all they offer now. Sonofa…. http://www.t-mobile.com/shop/Packages/ValuePackages.aspx You can get 10GB with the value plans… How much time is left on your contract? Would it be worth it to pay up to a $200 migration fee? Very possibly! If you have a year or less, it would be 100 or less depending on how much time you have left. 3 cards – how much each? Did they come at the same time? This is my 10th week so I’m hoping to get something this week. Would love to take advantage of the phone sale this weekend. Sweet! Except I just bought a GSII :( I wonder if I can have them reimburse my original payment method. Also, all of the controversy of this being fake/ a scam makes me lol, particularly the ones with the t-mobile.com vs tmobile.com domain argument. LOL! Just because TmoNews doesn’t include the picture of the update? 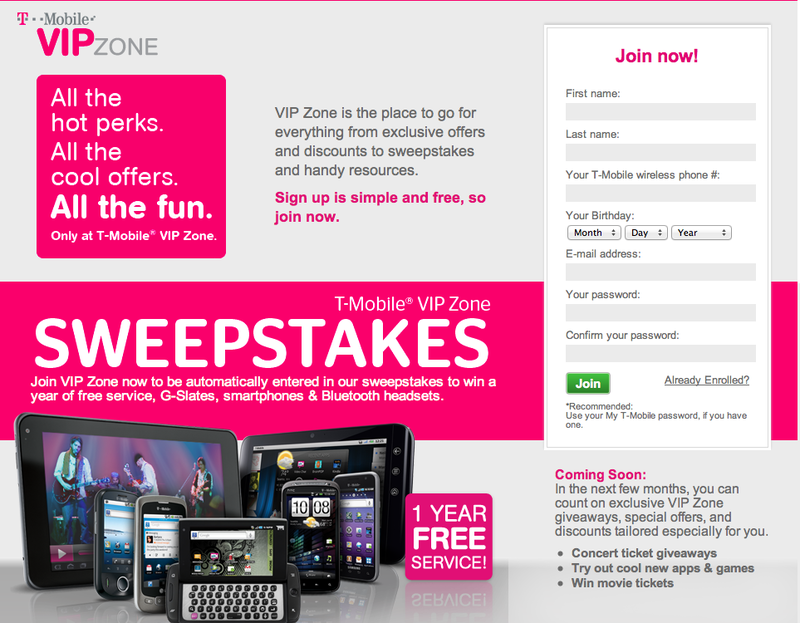 Here: http://www.phonearena.com/news/T-Mobile-to-unveil-VIP-Zone-loyalty-program-for-its-faithful-subscribers_id20812 Maybe that will make you feel better?